QAFL premiers Palm Beach Currumbin are looking for a new coach following the surprise news that dual premiership coach Chad Owens is departing Salk Oval. Owens has confirmed he is taking up an offer to be an assistant coach at VFL club Coburg and will be leaving the Lions after five years – the last four of them as head coach. Following PBC’s back-to-back premiership titles when they beat Broadbeach in the Grand Final in September, Owens had been making noises that he may not be around next year. Recent conversations with Coburg coach, ex-North Melbourne player Leigh Adams, led Owens toward the decided to head back home to Victoria after 16 years living, playing then coaching on the Gold Coast. He firstly played for Surfers Paradise, then Broadbeach, before branching out to the coaching gig as an assistant at Labrador. Owens said he felt pangs of guilt about leaving PBC at a stage when the club was aiming for an unprecedented hat-trick of titles. “This has come out of nowhere,” Owens told aflq.com.au. “I had been speaking to Leigh all year because we did our coaching courses together. “Then last week he made contact he offered me a role to work with him. Owens said the chance of winning three senior flags in a row was a ‘pretty selfish’ excuse to hang around but the Coburg opportunity was one too good to knock back. “I feel bad and it’s not something I enjoyed doing,” he said. “I enjoyed it all here and the one thing I really like is that the club is in a strong position – and the coaching job is a pretty desirable one, I would think. Owens was originally from Wodonga before he moved north but now is heading back south with wife Bea and sons Luis and Connor. He joked about giving up his job at Palm Beach Currumbin State High, where he was heavily involved with the Aussie rules academy as well as leaving a premiership side well equipped for more glory in the future. “The weather’s crap here and I want to get back to something nicer,” he joked about the winter chills coming up for him with no more Gold Coast beaches in sight. PBC president Anne Cornish stated the obvious when she said it is most disappointing to see Owens and his family leave the club and the Gold Coast, but Victoria has more to offer to enable him to pursue his coaching career. “Chad was instrumental in helping to drive our club’s efforts and it is pleasing to that to see that our culture, attitude and success have assisted him in furthering his career,” Mrs Cornish told aflq.com.au. “We are advertising for a new senior coach and are confident that strong interest in the coveted position will be attracted. Mrs Cornish said the 2018 premiership squad remains intact with only one player loss in James Holland, who is also trying his hand in Victoria after signing with Frankston. “Our club’s playing group is determined to continue to strive for success and now looks forward to working with a new senior coach in 2019,” she said. 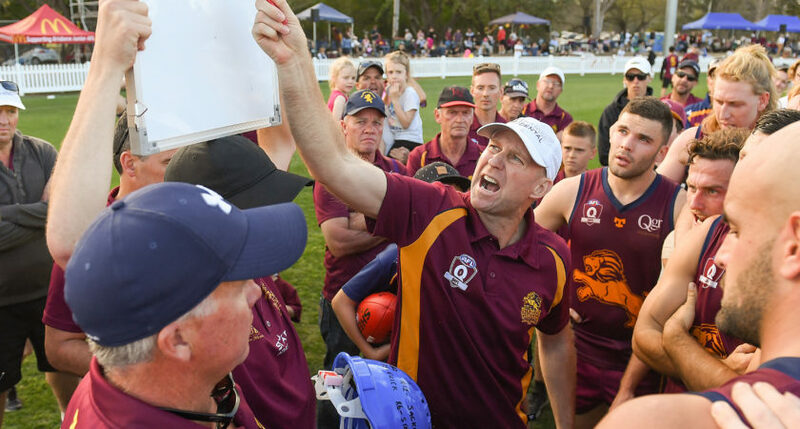 Owens’s departure from PBC means that six of the nine QAFL clubs – the Lions, Broadbeach, Morningside, Mt Gravatt, Labrador and Wilston Grange – will have new head coaches in 2019.